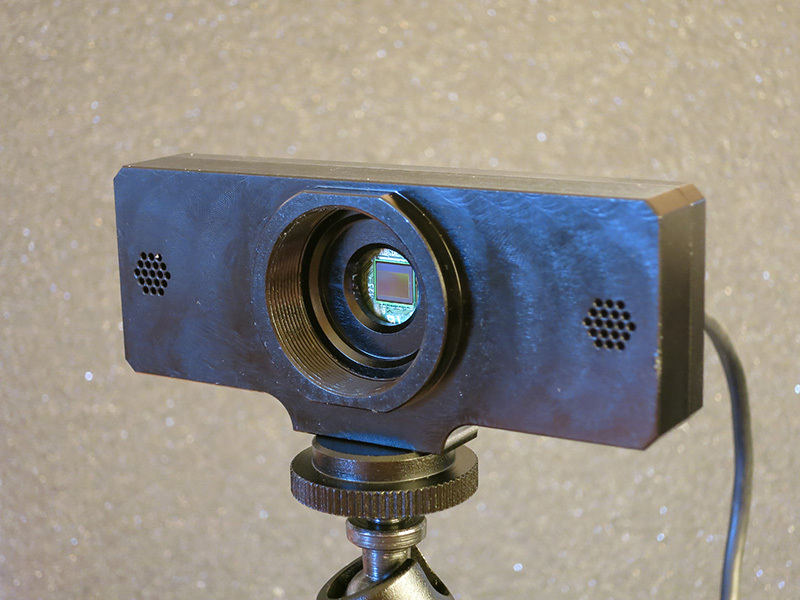 Logitech C920 is a wonderful webcam. 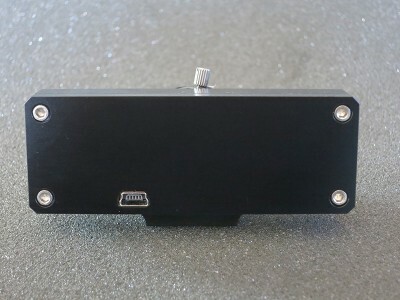 It produces good picture quality and has hardware H.264 encoder. It can do real full HD streaming (1920×1080 p @ 30fps). But this webcam lacks one feature – it has fixed lens which sometimes is not acceptable. Also by removing stock lens you have access to infrared (IR) part of spectrum. There comes custom black anodized aluminium case. Good news! I have received even more professionally manufactured C920 cases. To minimize confusion I did not created new post, but updated old one instead. Since today I have several high quality black anodized casings in my hands. I share some pictures and assembly guides with you. New case with 6-100mm zoom lens. 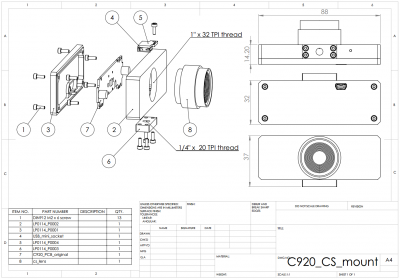 C920_CS_case – Here you can download PDF manual. Aluminium case weights 77 grams, and assembled (without lens) 87 grams. I vandalized plastic case, removed electronics and build my own version of it. 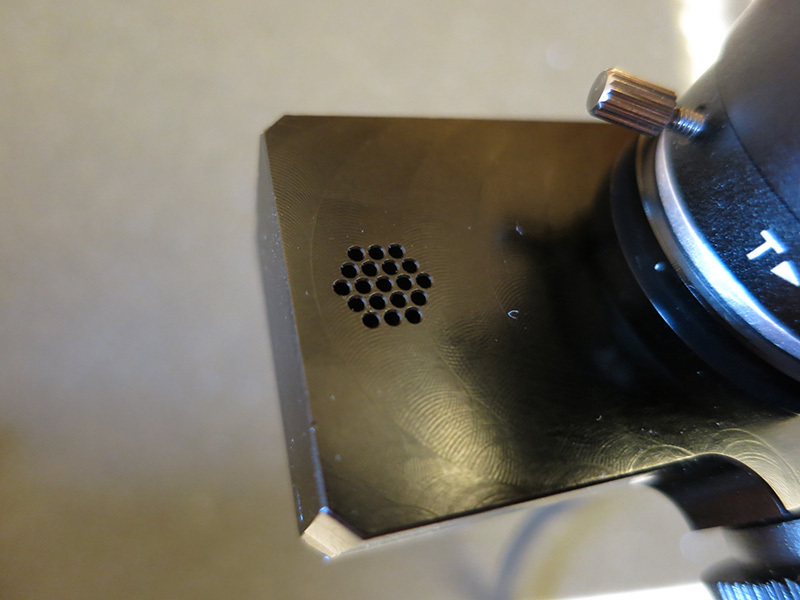 Here comes improved aluminium housing, which is much more comfortable to use with most scientific applications. General view. Mounted on 1/4 sceew. Fantastic! I would love to have one of these cases. Do you plan to make the plans available or to sell copies? Would you be willing to pay ~50USD? I could order small batch (10pcs. or more) if there were more interested people. 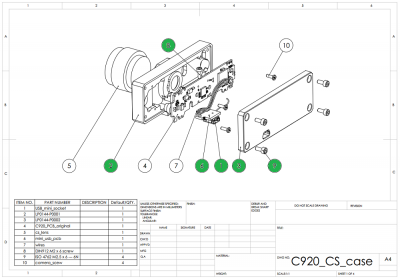 Of course there would be detailed instructions how to make C920 modifications. That seems like a fair price. I only need one myself. Next week I will have more details about one more sample. I’m interested in purchasing one of these cases. Please contact me when you have time. 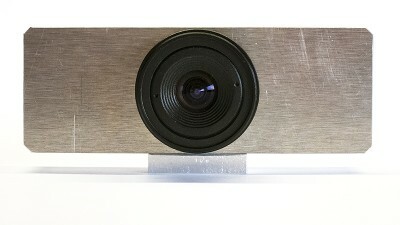 Hi there, I’m interested in this idea, but wonder if you’d considered making a similar case mod for the Mevo Live streaming camera? It’s great all in all, but the lens is way too wide, and something like this would really help! I’d be willing to pay, definitely, and very others would, too! Hi Jason, actually after Logitech rework kit’s I made also Kurokesu branded camera https://www.kurokesu.com/shop/cameras/CAMUSB1 Now more cameras are in development. There were no intentions to make Mevo Live rework kits so far. Great! Please PM me for ordering details. I hope I will have them manufactured next week. Hi I would really like to buy your cases or a converted camera complete ready to go. Could you email me at mleighmallory@aol.co.uk please. Mike. What lens did you put on it? It’s a 2.8mm 1/3″ cheap lens. So, you took off the CArl Zeiss lens? If so, why? Len, I can use not only cheap ones (like in this photo), but any C or CS lens. Which means telescopes, super wide, infrared or any other lens you might think of. Can’t really tell which one is better in photo mode. But for stop motion I would go for something better than webcam. Although if you need video, chose C920 – it has hardware h.264 encoder. Thanks for the reply. I did used to have a DSLR, but it was huge and I was afraid that I would wear out the mechanical shutter with all the frames I need to capture. A webcam is easier as you can just grab and image from the live video stream and it’s small enough to fit on an animation set. 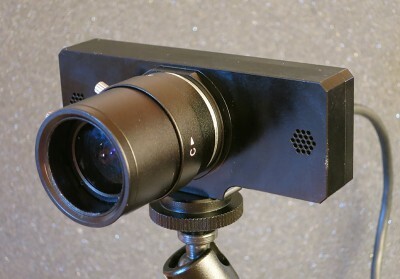 This is why I’m trying yo get the best of both worlds: a high resolution webcam with good quality lenses. Hi Syreeta, I have no C910, therefore I can’t tell if board is the same size. Seems that there are two PCBs inside the C910! I wonder if it’s possible that the mics and camera sensor are both separate? Could there be a way to run the sensor alone? That would make it really small! Or maybe even exchange it for a better sensor! Maybe I’m overlooking things, but it really is interesting. Is there any chance of seeing some footage from your modified C920? That would probably be the best in seeing if the C920 is worth it. I have tried putting a different lens on the C920 once (even making a custom lens mount for it out of resin), but it didn’t work out so well as I couldn’t figure out the distance the lens needed to be from the sensor and also what size lens was needed. 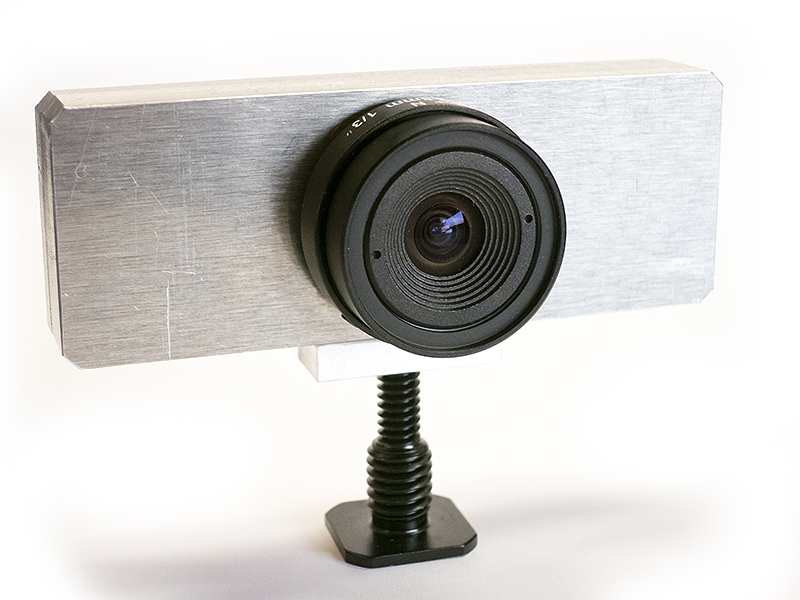 I’d love to see what C/CS mount lenses can do with this webcam! I have none assembled camera left. But with megapixel lens (i.e. high quality) picture is really nice. Sure this camera has limitations (bad low light sensitivity, dynamic range). It should be used in daylight or good light conditions. Email me. Interested in buying the case!! Was looking to purchase this mod. Is it still available? Please email me for ordering details. Thanks. I have application for vertical mount. Can you locate the adapter on the side or on the back? I like your project, thanks for the writeup! 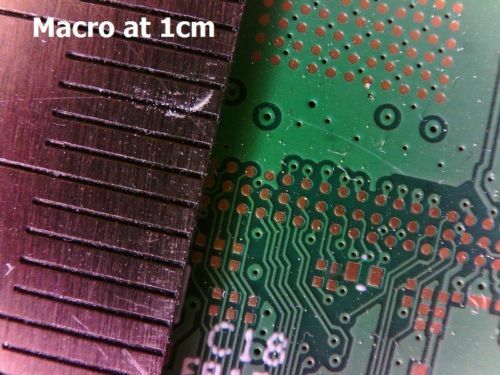 Do you have the physical dimensions of the CMOS chip in the C920 (ie, millimeters height x width)? I’m looking to modify a webcam to take M12 lenses, and I want to calculate the angle of view before I commit to a camera. I really just want to know what webcam has the largest imager. =) People say the C910 has a “larger” sensor–do you have info on that camera? Hi Jesse, C920 6.00mm W4.80mm H3.60mm (16:9 format), I do not have information about C910 sensor size, but looks like it is has 4:3 aspect ratio and has bigger height value. So dimensions are bigger. Thanks Saulius, that’s very helpful! Please email me, I’m interested in buying 3 cases. Can you tell me a little more about how you installed the lens? Is it screwed to the case or did you add a mount to the PCB? There is thread in enclosure. No mount on PCB. Can you comment on the lens specs (FOV, F, brand)? Also, is there a noticeable difference between the stock lens and a CS mod? Jose, most Megapixel lenses will work. You can chose any lens you wish ranging from fisheye to telephoto. Or you can mount on microscope and replace >1k$ camera. Or you can shoot in IR or UV range. Don’t get me wrong – Logitech’s lens is pretty good, but it is has annoying auto-focus and fixed zoom. Hey there, that looks just awesome and I bet the image quality is far better with a lens like that. Do you still sell this case? Hi Indel, I am arranging MP right now. I have new design and cases should be anodized in black color. I will let you know on any further updates. Sounds perfect. Please do keep me updated, I will definitely buy one! That looks really nice. Is the mounting block still removable? Indel, mounting block is not removable anymore. It’s cheaper this way. Do need it to be detachable? It would be better for me if it was detachable. Would look much cleaner and would make it easier to put on my own mount. I see. It’s kind of to late to change for current samples. If there is demand, I will change back to 3 piece design. I guess I can just shave it off and repaint it. If you need >10 pcs, I can make what ever you need. For everyone, who still needs cases – finally ordered samples. As I said before, these will be sandblasted and anodized in black color. Can you post an email address so down the road I can inquire? first of all the idea sounds great, I need something like that for my Logitech C920. Is there an infrared filter integrated? Or is there just a hole in front of the sensor between sensor and lens? With this mount, can you place the webcam exactly in the way that the optical axis of the lens matches the center of the sensor? Would you send this mount to Germany? Kind regards, great job so far! * Infrared filter is absent, you have to take care of it by yourself (use appropriate lens or attach filter to matrix). * Correct. CMOS is aligned with mount. * Sure I can send to Germany. Write me an email for further details. Everybody, who asked me if these cases are available. Finally I have several ones available. These are high quality black anodized aluminium ones. I offer full kit (case, USB board, screws). Can you comment on pricing and shipping costs (to Uruguay, South America)? José, please write me to my email. I am also interrested in a case. … ah , and how long will i take till shipping. Dear Ralph, check your email. Can you please hit me up, thanks! Dear Dylan, check your email. We may be interested in purchasing several of these, for use in machine vision applications. Would it be possible to ship to the UK? Dear Nick, check your email. Do you still have any? I am interested as well? Do you post to the UK? Dear Animaniac, check your email. Hello, I’m Interested in one unit, can I pay with PayPal? Thank you! Dear Manuel, check your email. Could you please let me know how I can order one of these cases for myself? Dear Jake K, check your email. I’m interested in this kit, is it for sale? Dear Oleg, check your email. I’m interested in two (2) if you have them. Dear Bruce, check your email. I am very interested in you case, how do I order one? Dear Janus, check your email. Im interested with your custom case work. What kind/size of lens that can fit in? Hi Khairi, case can fit most of CS and C (with 5mm adapter ring) lenses. All general questions goes here and if you need one, please write me an email. I’m interested in one of your cases, do you still have any? Dear Jed, check your email. This is exactly what I have been looking for. I hope you still have one available. Please let me know the details on purchasing one of these housings from you. Dear Richard, check your email. Hi Richard, somehow emails sent to you are bounced back. Just wanted to let you know that C920 kit’s are on stock again. Dear Louis, check your email. Dear Hillar, check your email. Dear Sami, replied to your email. We have a system to record the class lessons in our university, and we are using logitech c920 Usb Cameras. We would like to purchase several cases, because we use lenses to correct the image of the logitech camera. Please contact us and give us information to get your cases please. Dear Nacho, check your email. I would also like one of these!! If you are no longer making them I would gladly pay for the stl file so I could print it. Dear Charles, I have plenty of them. Replied to your email with more details. I am interested in one of your cases…how can I purchase ? Dear oz, replied to your email. This is great, may I know how to purchase if its availible? Dear Fandh, please check your email. Starting today I will include 2 ball allen/hex keys (1.5mm and 2mm) free of charge. Sometimes it might be unclear how to solder USB wires. Here are couple of photos how it looks before and after soldering. I see the eBay listings have ended. Do you still have these cases available? Hi Satish, I have reached my selling limits very quickly. Cases will be relisted next month. Also please check your email with more details. This is really cool and it might work perfectly for an application I have but is there a way to keep auto-focus working? I am amazed how awesome it looks. I would definately be interested in buying one of this cases. Great work! Hello Filip, Thank you for kind words! But tell me, do you have any photos that were made using these case? Filip what kind of photos/videos do you need? Some are http://lukse.lt/uzrasai/2014-10-custom-made-ir-block-filters-for-c920-case/ made with 2.8mm lens. Yep, I saw that ones. I was wondering what a video look like with standart macro lens. Filip, I will upload some pictures/video later today or tomorrow, have no camera with me at the moment. 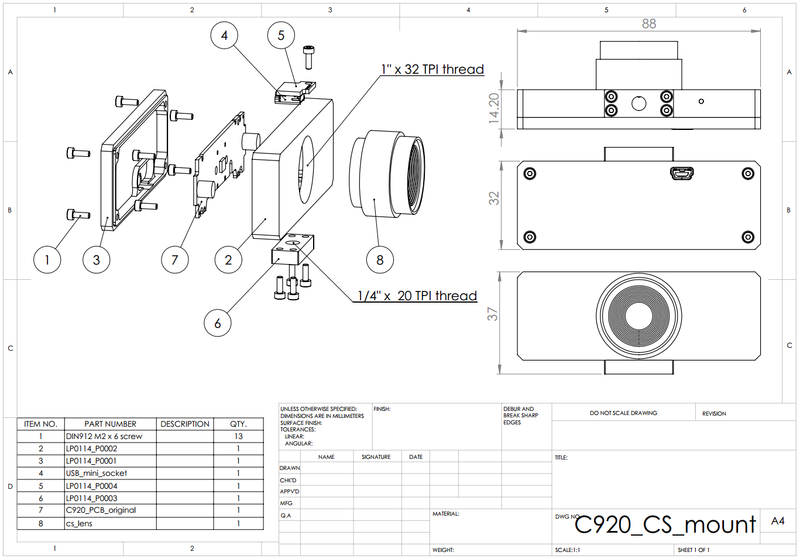 We are workink on an outdoor projet and looking for a partner that could customis for us a camera (the logitec C920 our better) with specifi mount, case and IR filter. Would you accept if we send you some spec to have a look at it please ? Hi Max, sure interested! I will send you email soon. We bought 4 casings from you through ebay, and we want to buy 6 more. Are you going to resell the casing in ebay sometime soon? Of course, there were few larger orders and I am temporary out of stock (have only 2 left and will re-list in a few minutes on eBay). I was in China last week meeting manufacturer and ordered next batch. I think I should receive next batch this year. I got 2 casings from you, but I just realized that I am missing one usb adapter circuit board and 4 screws in the package (to Clemson University). Can you ship those when we order 6 more the next time? I assume that you will re-post your casings in ebay sometime soon, right? Dear JP, I am terribly sorry to hear this. There was some mix-up. I will resend missing parts in any case. If you are willing to wait, new cases will be re-listed in eBay in a week or two. New batch is is manufactured and on the way to me now. Please let me know if you would like to get missing parts sooner. I think the process time of the new order (from our side) will take more time than I expected because of Christmas vacation, so I want you to send missing parts as soon as possible. Please, send those (usb adapter circuit board and 4 screws for casing) to the following address. Thanks. Hi, I will send missing parts today. Also there is possibility to make your own custom filter of any required specifications (IR high pass, green, UV pass, etc.). Hi, I bought your case and IR filter on eBay. I have the camera wired and ready to install, but I am not seeing installation instructions for the IR filter. Can you help? Hi Jack, thank you for your question. Please look at post about IR filters. You did some amazing job with that camera. I am currently using two of them for medical purposes. I’m a French MD looking for motion control during treatment. I managed to perform some real time analysis of movement with OpenCV, and C920 just does the job. However, I would like to improve focus on the body parts i’m monitoring, in order to get more accuracy and maybe decrease CPU load by reduction of camera resolution. I’m not much knwoledgeable in this field, so I was wondering if you thought that I could adjust a manually controlled zoom to your case. If the answer is positive, then count me in for 2 cases and their lens, I’ll buy them on ebay. Thank you for kind words! I was always inspired by computer vision applications, and actually that was the purpose of this case. Actually by using this case you get rid of original optics and can use any CS or C type lens. These lenses are controlled manual way. Usually this is focus, but can be iris (aperture) and zoom. 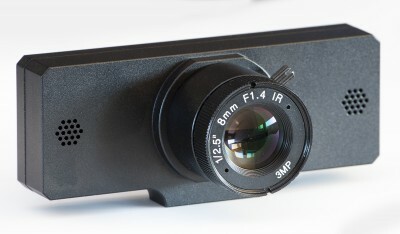 Google for “2.8-12mm Manual Focal Iris Zoom Lens” example. Do you have skills and tools to rework original C920 cameras or you need a service to put electronics inside aluminium cases I produce? Do you mean soldering tools and so on? I don’t have any at the moment, but I guess it must not be that complicated to get my hands on it. Same thing for the skills. I used to be an engineer, albeit not a very skilled one. But I wouldn’t mind a screwdriver or two in the package, and maybe some advice if I get stuck ;-). And if I REALLY get stuck, I’ll be happy to pay for your services. I think what you sell is exactly what I needed to finish my prototype. Please let me know how I can cite your work in publications. Going to ebay right away. 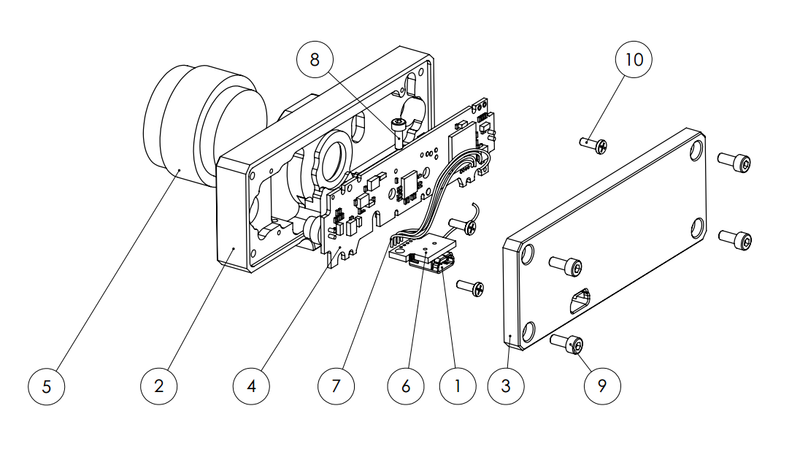 Hi Marc, actually assembling camera is not that complicated. Most complicated part is to solder 5 wires. Tolerances are tight and using wrong tools might occupy some tome to accomplish this rework process. I would be glad to help you if you have some problems reworking C920 cameras. Just to make sure – What publications are you talking about? Scientific publications. Basically, technical publications of some sort in medical journals. What do you mean, tolerances are tight? What tools do you recommend? Actually anyone with basic skills of electronics can handle rework process. 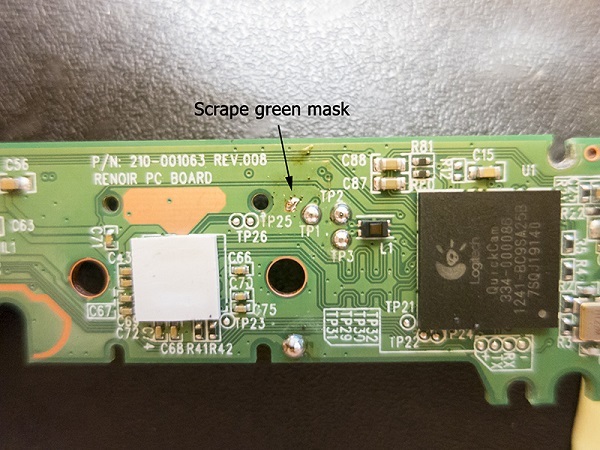 There is one place on C920 PCB where you need to scrape green solder mask with scalpel – to be able to solder GND wire. Soldering 5 wires from included USB board to camera is also not a big problem, just soldering iron must be equipped with fine tip. Everything else is common sense (dismantle original C920 case, unscrew lens and unsolder focus wires, collect screws PCB holding screws and use these for assembling into new housing, solder 5 USB wires – recommended length of these are documented). It is a bit tricky part screwing M2 screw to hold USB board in place, but using included ball allen key helps a lot. 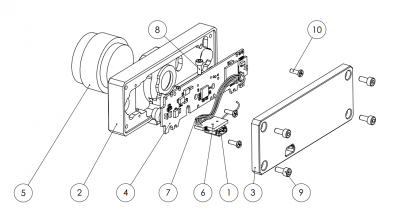 This camera has part number – LP0144. In a reference you can state my web page and or my name. Apart from that issue, I’m very satisfied. Cs mount adaptor is very convenient. Hi Mark, I am so embarrassed to hear this. This is totally my fault – I will resend you missing parts as soon as possible free of charge. It is ok really, one case is sufficient for the moment for demo purposes. If you resend the parts, do you mind sending them to my parents’ instead? It seems that it is much faster if it reaches France mainland before the island. They will send it to me afterwards. Besides, it will be much cheaper for you. Hi Mark – no problem. Will send on Tuesday (we have Easter holidays here, so post office is off-duty). I noticed I kind of dirtied the sensor while manipulating the elements. Do you have a tip to clean it without endangering it? I actually think I might have damaged it while soldering. Also, I think I might need a couple of cameras more. Would you consider providing a service to rework the camera with your case? I would feel more confident if you did the job. If so, what would be the cost? Indeed reworking is delicate job. Great , I will buy one for the moment. However, do you mind putting an IR filter inside and setting in up in usual position? I would like ti minimize dust on the sensor and I need a filter aniway. Please tell me what is your price and how I could pay you. Thanks man, great job ! I will put a 100mm zoom on that one. Hi Mark, please check your email. Hi there, I was wondering if I could ask a few questions regarding the case, IR Filter and CS Lens’. I work for a creative advertising company and we use the c920 inside custom made screen enclosures that we fit with touch screens and original interactive games. 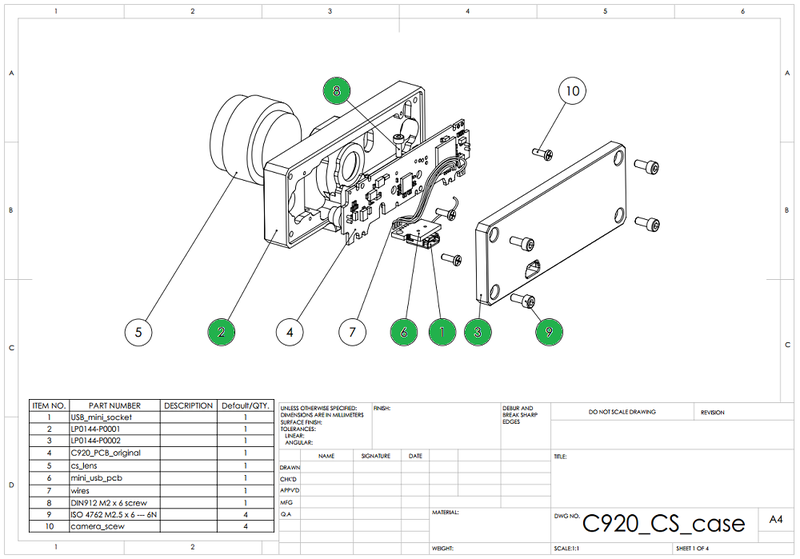 currently we are trying to customise our c920’s to use in our enclosures. Your case clearly stands out as a great looking alternative housing. My knowledge of lens’ is nonexistent. could you recommend a lens that would work for this application? it needs to be as clear as possible so that the person playing can clearly see themselves. 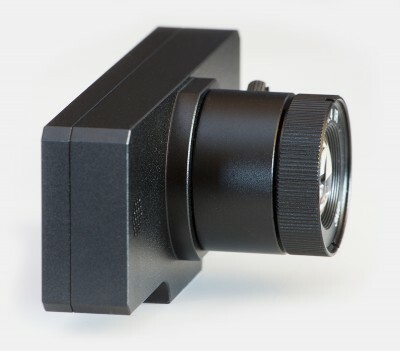 Is there a low cost CS lense that is in the same league or better than the internal carl zeiss (apologies if thats a dumb question) we obviously want the best quality for our applications. could you also provide any information on how the IR stuff works as well. It is a pleasure for me you have stumbled upon my blog! Lens. To be short I can recommend 2.8-12mm variable zoom and variable iris lens. This should suit most of the needs when used indoors. View angle can be adjusted in a range of ~25..100 degrees. Or in some cases I go with 1.55mm fish-eye lens, if distortions are not a problem for you. It would give you ~180 degree view field. I know verified supplier in China for these lenses and have several samples. I am not officially selling these at the moment, but working on this. These lenses are pretty high quality. I don’t have tools to measure how well they perform compared to carl-zeis one, but they are definitely in the same league (not sure – slightly better or slightly worse). IR filter. By removing stock C920 IR filter camera becomes sensitive to IR part of the light. This is good if you want to have infrared lights, but image will be black/white (reddish actually but mostly this carries no useful information, therefore mostly converted to black and white). That’s why I have measured precisely in optics laboratory Logitech C920 original IR filter and ordered custom made ones. These behave exactly like stock filters, therefore color of captured picture remains unaltered. If you need more details, please send me an email or we can have skype talk. Hello Saulius are you still selling the IR filters for your case on Ebay I can’t find them listed anymore. I was using The C920 cameras to live stream events but was always frustrated like you that there was no optical zoom possible. Your case is exactly what I was looking for so i ordered 2 of them today along with two lenses 5-100mm I can’t wait to put these together and see the results. I am a complete newbie with computer vision. I have previously removed the IR filter from a ps3eye camera, and used floppy disk material as a bandpass filter, however, the focus was horrible. OpenCV was giving runtime errors with the camera so now I am working on a project and am looking to remove the IR filter from a Logitech c920. How can I fix the focus on the camera? I read through the thread and see that a CS mount is mentioned. Would a CS mount eliminate the focus issue? Hi Tiffany, indeed using CS lenses would give you much better results (you will be able to focus manually). By the way I am working on manufacturing custom IR band pass filters designed for this enclosure. I hope I will have them in a month or so. Do you expect to have more anodised cases available soon? I would be interested in purchasing some more. Yes, I will have these cases re-listed in a few weeks. Stay tuned. Hi Michael, glad to hear you liked it! Hi, I hope a pair of cases become available for purchase soon. 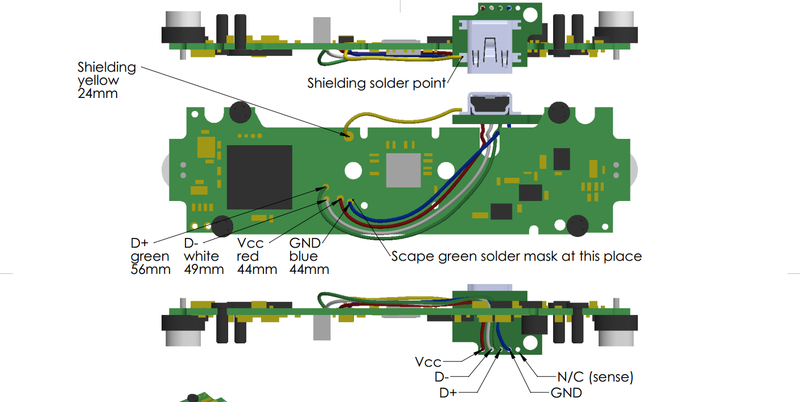 I need to do PCB inspection, Something like this: http://operationalsmoke.blogspot.mx/2014/05/diy-usb-soldering-microscope.html I really have no knowledge about lenses but basically I need about 10cm to 20cm working distance being able to see fine details in PCBs as in the link above. Do you think that those CCTV lenses (with the 5mm C-to-CS adapter) will work as needed or the ones on your eBay store will do a better job? Thank you very much for any comment you could give me about that. Hi Carlos, new cases will be shipped in a 2 weeks to me, so expect 3-4 weeks until I will re-list them. do you have enough coming on sale ? That’s great! I will have plenty in a coupe of weeks. I will send you an email when I receive new batch. Great, thanks- what about C930 by the way? If you need larger quantity, I can make according to your needs. I would ned anothrer of the C920 cameras, not just the case but the complete camera and house, when do you think that they will be available again?? Hi, cases should arrive in 2 weeks or so. Check your email for further details. I would like to purchase one of your new enclosure for the C920 but can’t find it on ebay. Are they still available? Thank you for your interest. It should be available in a 2 weeks. I will inform you when I get new batch. Could you confirm that the dimension of the enclosure is the same as in the technical drawing we find up here on this page? I’ll need to integrate the casing in an installation so I can prepare for it. Also, could you tell what is the cs lens equivalent to the one used actually on the c920. That’s right – dimensions are the same. Logitech C920 original lens focal length is 3.67mm. Hi I am interested in your for a computer vision project. Could you let me know when you get more in? Also what are the pricing on it? Tony :Hi I am interested in your for a computer vision project. Could you let me know when you get more in? Also what are the pricing on it? Hi Tony, I will receive new cases this week. Ebay http://www.ebay.com/sch/sauliakasas/ listing will be updated as soon as possible. Hi everyone. Cases are again available. Please visit my ebay listings. We recently ordered 8 cases. Did you get that order from Clemson University? Hi JP, thank you for your order on ebay. Cases were sent to you 2 days ago. I will send tracking number to your email. Is there any chance I could get the CAD files from you? Just want them in case additional modification need to be made to the existing case design. Hi Tony, if you need some modifications, I can make it for you. Unfortunately CAD files can not be shared. I understand, The model was going to be thrown in with our current system model and if changes occurred with the overall machine design we wanted to be able to change the housing to fit any new supports or see how it fits. It’s fine I already dusted off the ole micrometer. That’s a great news! Would you mind sharing what are you working on? Please update me if the casing is available for purchase again. Thank you. Hi, noted. Will contact you when new batch will be manufactured. Can you please email me. 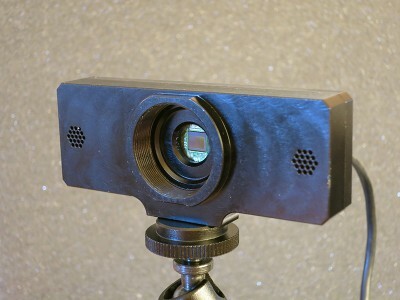 I am looking to modify this webcam and make it a wide angle than what it is now. Would like to know if your fixtures would help me do that. Hi Aditya, noted. Will remind you after receiving new batch. Hi. What is the possibility of using it for C mount lenses? Is a normal C to CS mount adaptor enough? Hi Xinming, just add 5mm extension ring and you can use C-mount lenses. C-mount and CS-mount lenses have different focal plane distance. So difference is 5.026, which is why 5mm spacer ring is used to adapt C-type lens. 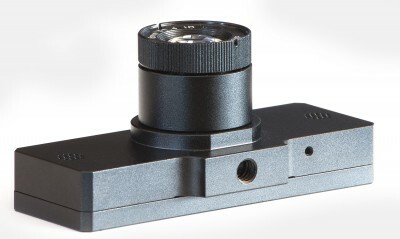 I think that I need a spacer for the microscopes that I intend to use the modified c920 cameras and my questions is can I buy 2 of these from you? No problem, at the moment I have none available, but will receive in 2-3 weeks. Will let you know at once. Received new batch of C920 cases. I tried to notify everyone who was interested, but if I did not by mistake, please check re-listed items on eBay. Would you mind sharing your 3d model (if you have one?). I have a RepRap 3d printer and would like to print your case. It might be a challenge, but I’d like to try it anyway. printing case with 3D printer is not a good idea – it will not have stability and precision required. Also I have put some amount of work into this case, therefore 3D model is not shared for community. Hope you understand this. You did a really good job with it, I’ll see what I can manage on my side with a 3d printed version. I mostly only need it for indoor use, so it doesn’t need to be that stable and precise. Hi, thank you for understanding. If for whatever reason you should decide that you need aluminium case let me know, I will give you better price. I’m thinking about using a C920 for live streaming an outdoor event. The original case can be weather sealed probably with a bit of Plasti Dip. Your CS-mount case plus a zoom lens is quite tempting – but how would you weather seal it? Hi Felix, I am happy you are interested in rework case, while it works perfectly with CS lenses, it lacks weather proof features, so you should put it into some outdoor rated enclosure (like CCTV cameras are used). Thank you for kind words. I do make prototypes by myself. Also I have few CNC machining contractors and make normal batches there. Wow! I recently purchased a C920 and just stumbled across your case. Pretty cool! Unfortunately I don’t have much use for one that I can think of, but it does look like a fun project and it looks awesome! I did check out your other blog entries and, wow. Awesome! Hi Eric, thank you for kind words! Hope you enjoy reading. I’ve been enjoying it quite a bit. Hi Eric, glad to hear. one question, do you know what i have to do for to take long exposure pictures with this camera? Unfortunately I have no information on long C920 exposure capabilities. Got the case yesterday, and assembled it this morning. It’s a neat piece of engineering! The screws saved when disassembling the original case didn’t work for the PCB. Even with a lot of force, I was not able to drive them all the way into those threadless holes. So I used shorter screws, also from the original case. The filter could have a larger radius, then it would stick better to the double sided tape. Thank you for notes! Indeed you must apply some force to screw these tiny screws, but I had no issue so far (no broken screws or twisted caps). Of course decent screwdriver is recommended. Also glad you solved this issue with shorter screws. What’s about Ir filter – it was designed to fit from top and bottom sides so I could not increase dimensions. Anyway I have learned from my trials with filters and have updated filter mounting design – it is already incorporated into new camera. Will share specs and pictures this week. Looking forward to the new camera. Thanks for the fast response! It seems I have joined the party late – I found your site while searching for ‘C920 inside’ on Google Images, as I wanted to see how I could disguise/house the camera better in a research lab. Firstly, great work – I can’t wait to read up on your instructions and start my own project. Are you planning on getting any more cases made anytime soon? Should receive next batch next week. Will note you on email. I am very interested in your housing. Will these be listed on eBay when they become available? How much are they? Thank you for your interest. Cases should be available this week. I will note you via email. I would like to purchase the casing. Will it be listed on ebay? Would you consider purchasing on fresh opened e-shop http://www.kurokesu.com/shop/? Also if you prefer ebay, I relisted it moments ago – http://www.ebay.com/sch/sauliakasas/m.html. I am interested in adapting the c920 for close focus work. Specifically to 1) view small print items on a PC monitor and 2)perform screen capture and OCR on the images. Not being familiar with lens, can the 2.8 to 12 mm zoom lens provide relatively close focus and suitable magnification? I am a person with low vision and don’t want to invest in a stand-alone magnification system for reading. Hi Jon, with 2.8-12 lens you can focus from close distances and achieve result like . However I don’t know how do you plan to use it – in macro mode camera has to be held pretty stationary. Impressive photo. I can’t say when I would need a macro function, but I can envision it. The bulk of my application would be to magnify text for screen reading. Ideally at a distance of 20-30 cm from the front of the lens. The standard c920 is a bit fuzzy with near objects and the typical text size on screen is not large enough to be a help.I am also considering building a light stand to provide even illumination of the page under the camera. Hello there, could you possibly let me know when you will have more of those Logitech c920 enclosures available? 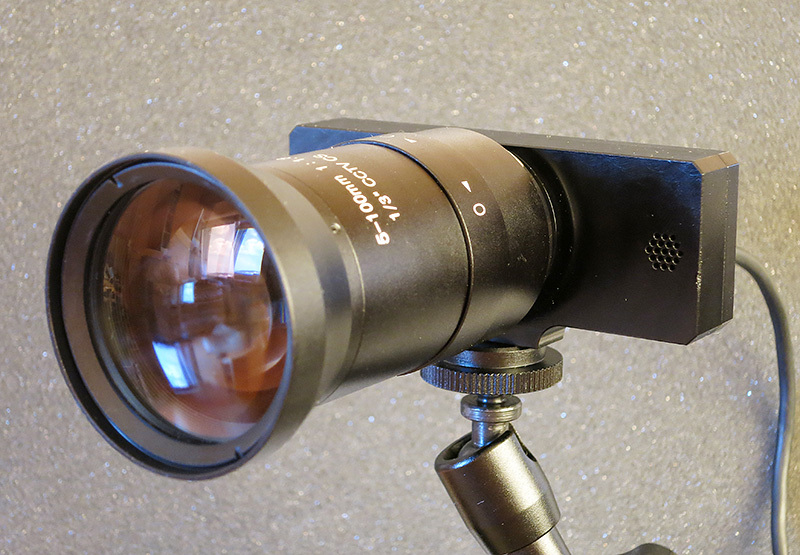 I would like one so I can mount my camera on a Vortex HD spotting scope to monitor hits on targets at the range. Thank you for your interest. I should receive new batch in 2-3 weeks. Will let you know as soon as possible. Excellent, I very much look forward to getting one. Thanks for uploading the details of your product. I would like to buy your product but I am in India and we have an urgent requirement for this case. I would be really grateful if you can share the 3D model of the case with me. If you are able to ship to India I would like to buy 5pcs also. My email id is deva……@…..com. Just noticed that the front tube of the 2.8-12mm CS 1/2.7″ 1:1.4 lens easily comes lose, means I can remove it. Can it be fixed? Otherwise, I’m very happy with the case and the lens! Just used it to record a short video. Here I wonder if there are better applications than the Logitech Webcam Software. In particular, I’d like to have a higher resolution preview. Hi Felix, the very front ring (3mm) can be safely unscrewed. This is decorative ring, maybe it was not tight enough or loosened during transportation. Fell free to screw it back while holding tube with lens information on it. Or if I misunderstood your problem let me know, I will replace the lens. I don’t see a way to fix it without also locking focus. Anyhow, the lens works fine, so no need to replace it. Thank you for update Felix! What’s about recording I suggest trying http://kinovea.org/ – it has plenty of interesting features. 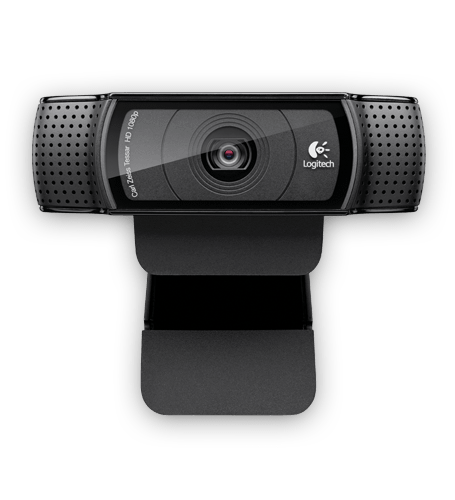 but would much prefer using the logitech c920! Does the lens at kurokesu shop (CSLZFAA2812) do 10-50x magnification – suitable for smt work? If so, can the focus be adjusted by hand, or only via electronic controller & software? If the lens AND controller are needed (i.e. 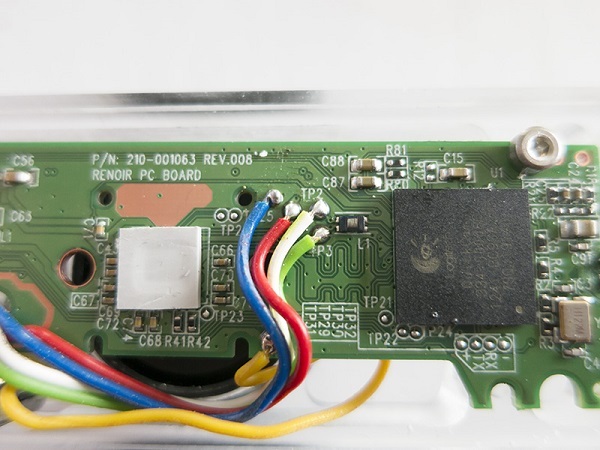 PCBA_CTRL_ZOOM1_BUNDLE), is this bundle designed to fit in the case (KITC920)? Because the original lens has filters built-in, will using the above lens upgrade on the C920, require ir filters? Can you point me to what product(s), I would need to upgrade my C920 for 10-50x microscope work? I owned few microsoft lifecams, but they were buggy after some time USB connection closed and in order to restart USB had to be re-pluggyed. Maybe this was only my experience. Also C920 and C1 has much better picture quality than MS camera. 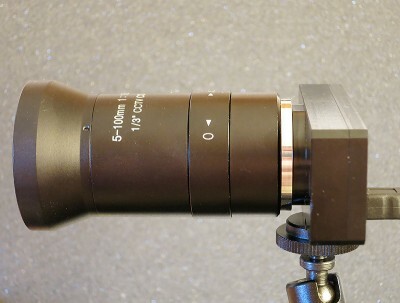 For SMT rework I’d recommend using microscope lens (not particular one, but something like this http://www.ebay.co.uk/itm/310781032908) Other kind of lenses while might focus at close range, not designed for large magnification. I am very impressed with the casing that you have made for c920. I am planning to use that array with an objective lens for my application. 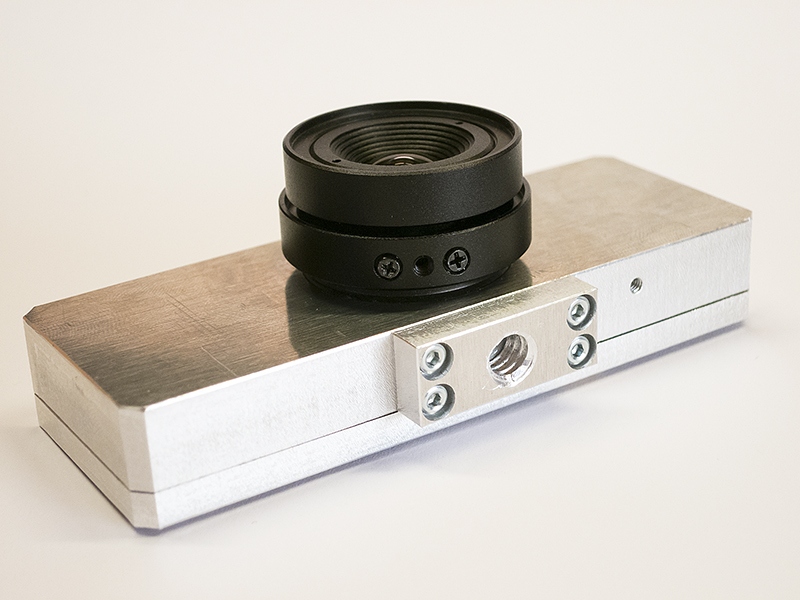 Are you aware of any adapter that may fit the objective lens into a CS mountable casing? Could you please let me know more details what lens do you plan to use? This is the type of lens that I am looking at. First things first: your C920 case is awesome! Great piece of engineering. I’ve got a working camera. Next, I’m not sure if your ears were burning Saturday night into Sunday because I was cursing your name! :) That darn USB screw is next to impossible to get squarely into the hole. I think there’s some manufacturing defect there. I watched your video, and there’s no way it goes that smoothly with that darn screw. I got it mostly in there, but it’s not tight. And now the screw head is stripped. I’m going to make a blog post about this soon and will share. I bought a CS to Nikon adapter, and I’m using my Nikon lenses which is working out spectacularly. I bought one of those $30-$40 Fotasy L5014 50mm lenses, but despite working initially, the lens no longer focuses at all! The case took two weeks using the $1 shipping to go from Lithuania to the US East Coast. Not too bad. That filter could stand to be a little bit bigger. I’ve got some dirt/dust on my sensor despite being pretty careful. All of the swabs online are for APS-C or larger sensors which will not fit in the lens mount hole, what exactly are you using to clean it? Amazon links? I’m in the process of adding a ring light and coming up with some way to hold the camera. I’m looking into using flexible gooseneck pipe. Anyways — fantastic design on that C920 case, I’ll follow up with more details later! First let me thank you for kind words. I also accept all critics – design has some flaws. I had good ideas (you mostly covered these in your comment) how to change enclosure, but started working on my own cameras and this project remains unchanged. 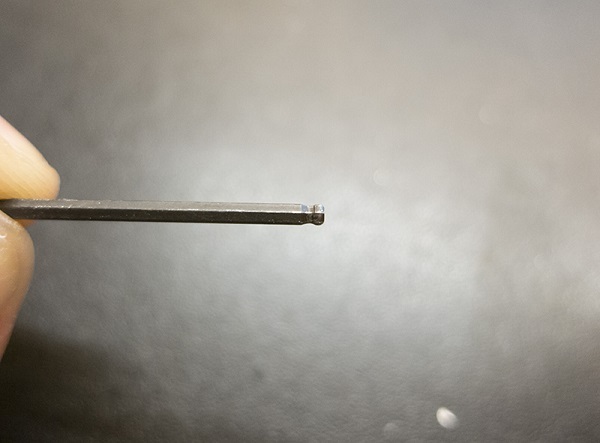 I use small lenspen and compressed air to clean optical elements. If there are some hard stuck specks I use sensor cleaning fluid microfiber cloth. Any brand should work fine. Swabs are too large to fit inside. As for the holding rig, I discovered that 11 or 7 Inch Magic Arm with C clamp works better than gooseneck mount. I will check into those Magic Arms to see if they would work better. I’m still playing around, and still early in this game. Let’s see what I can figure out! Thank you for sharing, Keith! Awesome results! Would you still happen to have any of these cases for sale? Would love to do this with my C920. I just now noticed the purchase link! :D Thanks. Hi, I would like to know if there’s a chance you could help me, maybe by giving me some more information, about how to remove the ir filter. I just bought the c920 and I have to make it ir for my installative work of art. I’m a little bit afraid of breaking the webcam. Thanks a lot! I guess you have seen few videos how to take apart C920, right? As a final step you have to unsolder and unscrew lens assembly. 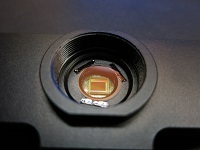 Cover main PCB while working on lens and be careful not to touch sensor. 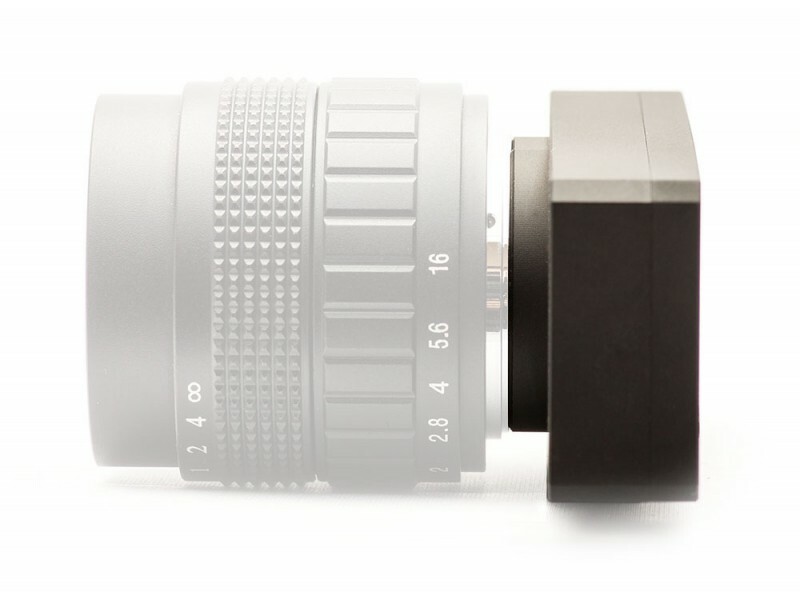 IR filter is installed at the bottom of lens assembly. I use scalpel and tweezers to gently remove it without breaking. But don’t worry if you break it, filter can be removed in pieces. Heating should soften glue and it will be easier to remove filter. It was a good advise! 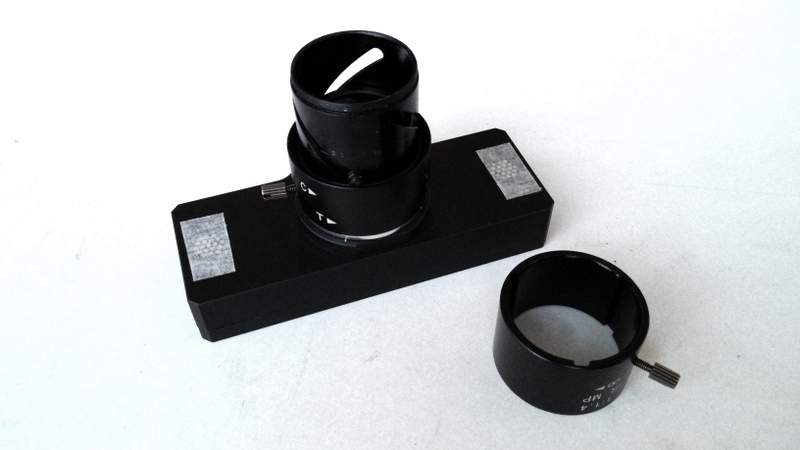 If you break filter, it is possible to purchase similar one (like this one http://www.kurokesu.com/shop/optical_filters/F1LOW650) for later installation (it’s larger and should be installed into another place, but it does not affect camera performance. Thanks a lot! I’m going to try to do it on thursday afternoon, I hope I’ll have luck. Greetings! We are using c920 for dual bike fitting capture using c920. The cameras capture is good. Is their anyway to improve the capture rate. Or improve clarity with lens changes to increase the quality so we can capture motion with ebpvem more clarity. The current cameras we have do not say Carl zeiss on it. Look like older cameras did. We tried the 922 at 720 at 60fps but they were blurred at the leg movement while pedaling. C920 is much better at 30fos for clarity for action capture. But always looking for improvements. If you can make something that works we would like to buy 8 cameras. We capture in a software with dual capture video at same time. 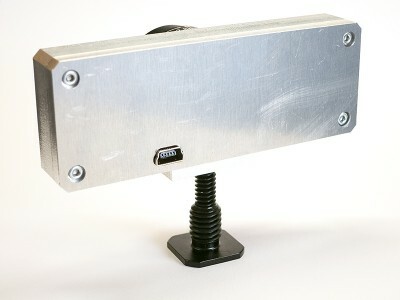 Like to use a 4 way splitter to change cameras to view different angles. There is a Logitech C920 PRO available. Does someone know, if there any Differences to the c920 (without “pro”) ? Is it same size ? Does it take place and work in the case too ? I can’t find any other C920 models, so I guess this is re-branded model. Also specs at logitech website match original C920 ones. Sveikas, turiu tau klausima. Pati pirma foto kur CS lesis ar toks lesis tinka PCB detalems priartinti per koki 5-6 cm atstuma nuo lesio iki plokstes?